The banking hall has been transformed to accommodate a new hotel lobby and restaurant, with a bar below. The lobby celebrates the building’s 1920s origins, with impressive double-height original timber-panelled walls and ornate ceiling roses. The gym is alongside a heated pool on the ground floor, which is enclosed on each side but open to the Brisbane sky. The hotel is also close to the Brisbane Convention & Exhibition Centre and Queensland Performing Arts Centre in Southbank, ideal for event and delegate stays. Typical of the Adina brand, the apartments are spacious and contemporary, providing guests with the comforts of home. Each apartment combines its own kitchen, laundry and living room with the ease of full hotel services including 24-hour reception. 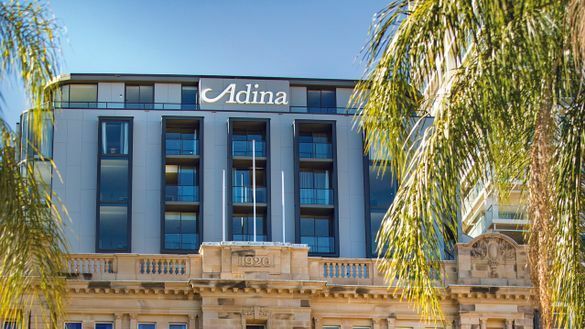 This hotel brings a new level of luxury to the Adina brand, as “Your Preferred Address”, with luxuriously appointed rooms, quality finishes and TFE Hotels’ new signature Dreamcatcher bed. Donna Chang brings together a stellar line-up of industry leaders, spearheaded by Executive Chef Jake Nicolson (formerly of The Lakehouse in Victoria, Spain’s El Bulli and The Ledbury in London), Head Chef Jason Margaritis (formerly Spice Temple, Melbourne) and 2014 Good Food Guide Sommelier of the Year, Penny Grant. Below the restaurant, a 250-seat bar called Boom Boom Room will fuse avant-garde design with an inspired cocktail list to form an opulent basement-level lounge. The bar will be housed in the space where the bank’s vaults once were, providing a visually dramatic setting. TFE Hotels, headquartered in Australia, is an international hotel group operating in Australia, New Zealand, Germany, Denmark and Hungary. TOGA Far East Hotels (TFE Hotels) was established in 2013 as a joint venture, bringing together two long established businesses, The TOGA Group’s TOGA Hotels, and the hospitality arm of Singapore’s Far East Orchard Limited, controlled by the privately owned Far East Organisation. With the property development and real estate ownership DNA of both groups, TFE Hotels has earned its reputation as the “developer’s hotelier” and “owners’ operator” with an end-to-end hotel design, development and management capability. Today, TFE Hotels comprises 72 hotels with 10,000 keys in Australia, New Zealand and Europe under six brands, with more than 30 more hotel projects under various stages of development.